The marks are a little vague and unfocused. Did you recently set your tomato seedlings outdoors? If that is the case, the marks may be sunburn (aka sunscald). Tender tomato leaves exposed to direct sun can get burned. The burned areas are usually a bit thinned and feel drier and crispy. If that is not it, my next guess would be the marks left behind by some kind of leaf sucking insect. That could be aphids, rust mites, spider mites, thrips, etc. Check the undersides of the leaves, see if you spot anything. Some of these insects can be very small and barely visible to the naked eye. Try shaking leaves (especially ones showing marks) over a piece of white paper, see if little dots fall onto it. Let us know if either of these seem to fit your situation and we can talk about what to do about it. Thanks @rainbowgardener. I'll get better photos tomorrow and post them here. Somehow these only affect the upper part of the leaf. No marks whatsoever st the bottom. Thanks again though. I just checked the leaves that had issues and found these underneath. Somehow theyre only affecting my tomatoes, the bell peppers and eggplants doesnt have these. Could these be leafminers or blackfly? Not leaf miners and not blackfly. Probably wooly whitefly (possibly wooly aphids, they look kind of similar). In either case, it is the leaf sucking insect I was talking about. You do want to get rid of them. Not only are they sucking sap and weakening the leaves, but they excrete the excess carbs they take in as a sweet sticky substance called honeydew, which supports other pests and diseases. Wipe each leaf down with a rubbing alcohol wipe to get rid of them, then rinse with water. 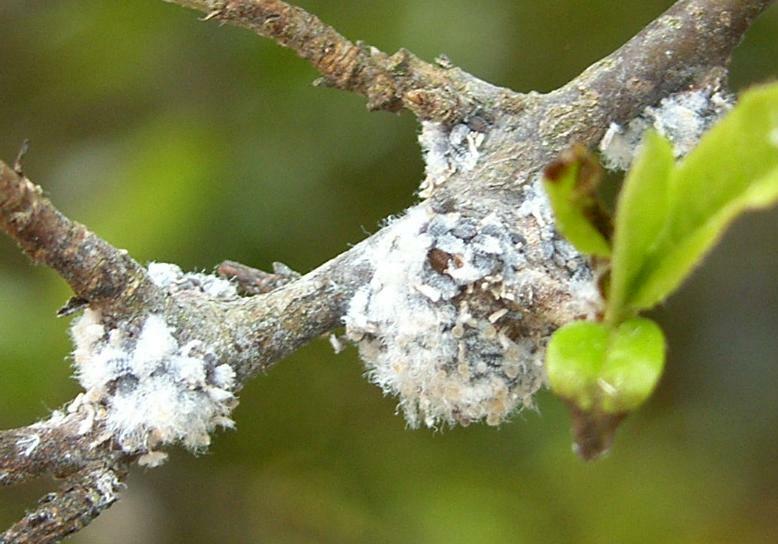 That gets rid of the visible insects, but not necessarily the eggs, so you may have to do it again if more show up. It helps to make your garden friendly to beneficial insects. Lacewings and other insects predators prey on them. As of now, I've cut off those that had the eggs and should I also apply rubbing alcohol to the leaves that shows these signs? I really appreciate the help on this one and hopefully this can take care of it. Will post updates soon as well. Update: done applying alcohol to all leaves and rinsing them with water. Didn't see much of the eggs and mildew though. Question though, will transferring location help limit this? I can transfer my plants to our 2nd floor balcony where sunlight is also available. what you were seeing was not the eggs, it was the actual insect. Just found this guy underneath the leaves. don't see a lot of them though. Does banana peel help minimze them as well? That looks like a whitefly. Sticky traps are usually recommended to catch the flying winged buggers, especially in the south where whiteflies can spread virus -- yellowtop? curly top? -- can't remember the name of the disease for sure. I actually saw two of them earlier and squashed them right away. I'll test out the banana peels tomorrow and provide feedback if it does indeed help. Although it would be nice if someone who had first hand experience can share as well. Somehow lady bugs and leafwings are pretty rare here which could have been a better option. Again guys, thank you so much for the tips and suggestions. Really appreciate it. If you don't want to do the alcohol treatment, you can try just spraying your plants (including leaf undersides) with soapy water. That would be a little bit of real soap (like Dr. Brunners or Murphy's oil soap, dish "soap" is actually detergent and can burn your plants) in a lot of water. Aphids particularly are pretty susceptible to this. But the "wooly" varieties are less susceptible being protected inside all the fluff. Still might work on them, if they are soaked well. Thanks. I did mix alcohol and liquid soap with water and that seems to work now. Just would like to ask though, does transparent plastic cups slow the growth of the seedlings or do they just need more sun? We are heading towards the summer season although it's been raining hard for almost two weeks now. I don't think the transparency of the cups should make a difference. When did you plant your tomato seeds and how many days did it take for them to sprout. Were they planted directly in those cups or did you transplant once already? I did transplant them once they had two sets of leaves and were about 3-4 in tall. Then I buried the stem just below the first leaves (cotyledons). We also had rain for the last weeks which might be affecting their growth as well. Ill post some photos tomorrow. Thanks!